Sauvignon Blanc is currently one of the hottest tickets around in terms of white wine grape varieties, with a renaissance led by New Zealand, and followed across the world. 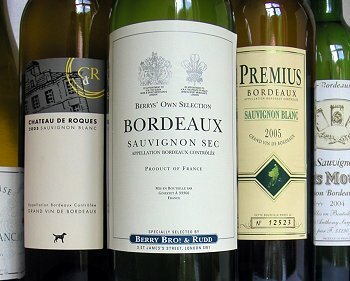 One traditional home for this variety was Bordeaux, where Sauvignon Blanc along with Semillon was the bedrock of both dry white wines and Sauternes. But between 1979 and 1986 more than half of all of Bordeaux’s Sauvignon Blanc was uprooted, at a time when white wines were less fashionable, and before the current Sauvignon boom was ignited. Now, Sauvignon Blanc in Bordeaux is catching up and catching on again, with producers making fresh, unoaked, moderately priced dry wines to tempt consumers.The Bordelais have clearly learned some New World lessons, so here is a run down on half a dozen easily available examples of the new face of Sauvignon Blanc in Bordeaux. As a general overview, this group of Sauvignons offers nothing like the fireworks and flamboyance of some of Marlborough’s more extreme examples, but then that’s probably not what the Bordelais would want to do, even if they could. The emphasis here, as with all Bordeaux wines, is on balance and food-friendly appeal. From the ‘Berry’s Own Selection’ range, this Sauvignon Blanc is made for Berry’s by leading Bordeaux négociant Ginestet in a dry, savoury style. It has an attractively steely nose, with lemony scents and hints of pear and juicy melon, but with a certain reserve and grassy freshness. On the palate it is lean and savoury: a much more lemon fruited and taut style than some, with just a hint of riper, more opulent fruit, but all constrained by tangy citrus acidity and a cool sense of elegance. A very composed and grown-up style of “everyday white wine”. £5.50, Berry Bros & Rudd. Fresher than the BBR offering, though perhaps not quite so savoury and refined, Calvet’s Sauvignon is much more New World in style with buzzing aromatics of citrus and exotic, tropical fruits, with a little blackcurrant leaf note. On the palate this is vivacious and fruity, with really sweet, up-front fruit, and a lovely tangy grapefruit and lemon acidity in the finish. Bottled in screwcap. £4.99, Co-op, Sainsbury’s, Waitrose. This almost transparent wine has an intriguing hint of clove on the nose, with some almost lily-like perfumed notes and a subtle, whitecurranty fruit character. On the palate it is equally fresh and exotic, with little notes of papaya and mango, before a big, dry sweep of quite pithy lemony acidity pushes through into the finish. A very interesting style this, and though lacking a little harmony, strikingly individual. £5.79, Forth Wines (Scotland). There is am attractively modern label for this modern wine, where the nose offers quite subtle, but steely and firm notes of white fruit with tiny floral and even mineral nuances. On the palate the fruit is lemony and taut, with plenty of life and ripeness, and a keen core of acidity. It seems a pound too expensive compared to others here, but is a nice wine. £6.99 – £7.50, Virgin Wines, The Good Wine Shop, Mr Lawrence, Longford, Wine Warehouse. This wine is from the 2004 vintage, so has an extra year in bottle compared to most of these wines. It has a lovely nose, with quite deep, yellow plum and peachy aromas, and an edge of grassy quality. On the palate the fruit is ripe and has a sweeter, softer edge than some, with more peach and an orangy character, with a dry stripe of white fruit acidity emerging into the finish. This is savoury and moreish, and nicely made wine. £4.95, The Wine Society.